Psilocybe are famous for their psychopharmacological effects - this is the primary genus of 'magic' mushrooms across the globe. Although there is a fair amount of variation across members of this genus, the following characters are distinctive: cap with a semi-gelatinous 'pellicle' (thin membrane best seen by gently breaking the cap flesh), dark purplish-brown spore deposit, attached gills, and blue-staining flesh. Similar genera include Stropharia with more viscid caps and not staining blue, and Panaeolus - sometimes staining blue but with different cap cuticle and with jet-black spores. 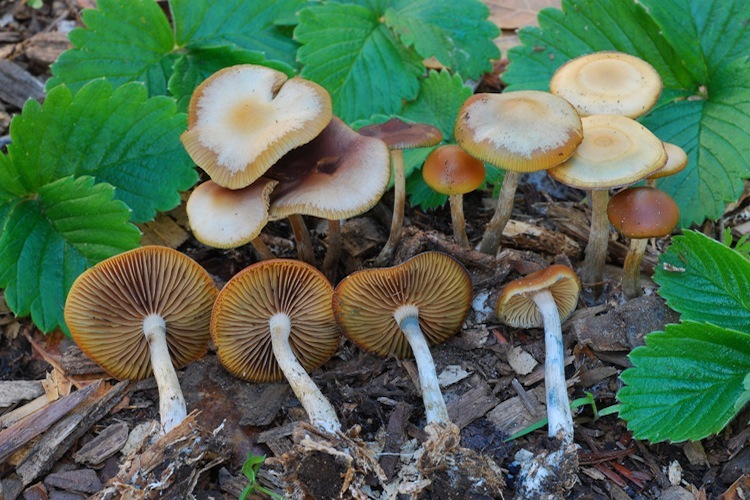 Some Psathyrella are vaguely similar to Psilocybe semianceata in shape, but never stain blue and are extremely fragile-stemmed. All the species of Psilocybe in our area are saprobic and probably introduced from elsewhere in the world. They have a nearly cosmopolitan distribution now due to their cultural importance, so pinpointing the origins of some species is difficult. Important identification characters include cap shape and color, presence or absence and type of partial veil, and substrate (compost/dung or wood chips? ).